Could Sprinters Take Back The SMR Nat. Record? The 1600 meter sprint medley relay is not a sprinters relay. This year though, the sprinters could take it back. The two teams to watch will be Bullis and Western Branch. Na'Taja Ballard of Western Branch pictured. It has been over 21 years now since the girls sprint medley relay record was actually a sprint relay record and not just based on the 800 leg. That is what makes this season and the VA Showcase so interesting. Back in 1995 the record was held by George Washington (NY) at 4:00.05. They were the last team to hold this record above the four minute barrier. Just two years later it was William Penn of Pennsylvania taking home the record in 3:56.67. Their splits were 25.5, 24.6, 53.83, and 2:12.55. That record, which stood for four years, is the last time it was a true sprinters' record. You had a sub 25 split and a sub 54 split; the big thing though is that you had a decent 800m split and not a superstar split. Things changed though soon enough in 2001. Making their way all the way from California were the girls from Long Beach Wilson. These girls ran a blistering 3:53.17 at indoor nationals with 25.1, 25.0, 53.3, and 2:09.5 splits. 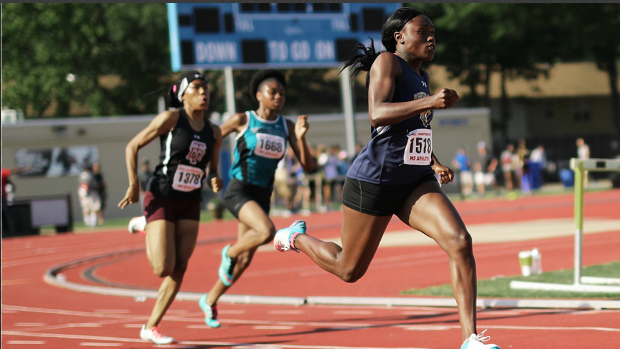 Though you could argue that Lashinda Demus' 53 split made a case for it being a sprinter's relay, the fact that Ashley Freeman anchored fast enough to win the national title individually makes it clear that this record was all about the 800 too. That record stood for five years until you guessed it, a superstar 800m runner came into the fray. 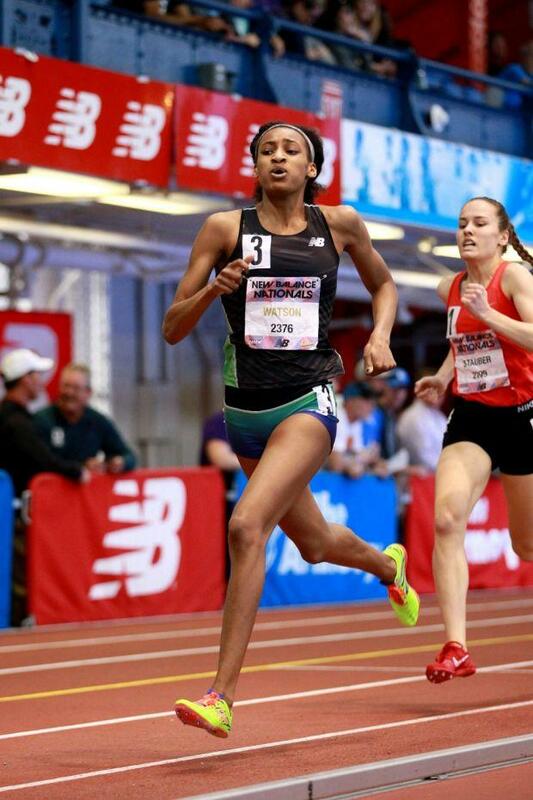 That runner, Sammy Watson, would go on to run 2:01.78 indoors as a senior. She helped Rush Henrietta set the record in 2016 thanks to her 2:06.78 split. That along with their 50.5 200's and 55.4 quarter brought the final time to 3:52.86. This year though, things are very different as we have two teams built to break this record without a sub 2:10 800m runner. Those two teams are Bullis (MD) and Western Branch (VA). The math behind this is simple. To break the record you have to run faster than 232.86 seconds. To get there you first take out the 130 seconds from the 800 split and then you choose how to attack the final 102.86 seconds. That means you can have two 24.5's and a 53.85 to break the record. Realistically you could also get closer to 48 on the first 200's and be just over 54 on the 400 as well. The point is, to break this record with sprinters, you need historically great runners on your team. Just like the runners Bullis and Branch have now who have won all the sprint relays these past two years at nationals. They like many others though have elected to not run the SMR at nationals since the other relays conflict with the SMR. January 19th this could change though as the VA Showcase will provide a suitable host for both teams and others to chase the national record while not making them take their runners out at nationals. That was the case last year where Western Branch actually won the national title in 3:59.16 but did so with only one "A" runner running. Meet management has not officially announced anything yet but it seems that the Western Branch vs. Bullis showdown is a go. 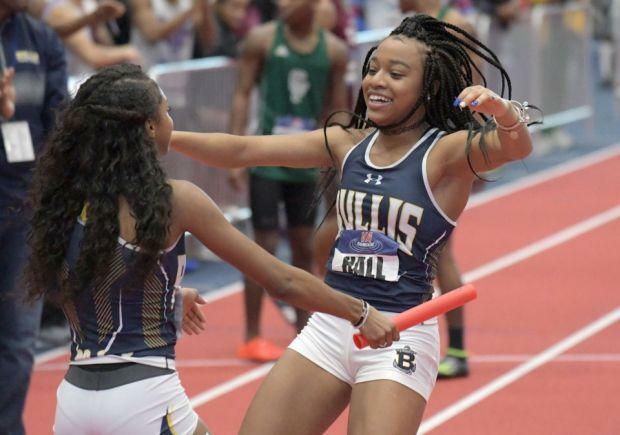 That means you will have Bullis who went 1:34.74 in the 4x2 and 3:39 in the 4x4 going against a team in Branch that won the 4x1, 4x4, Swedish Medley (1-2-3-4), and two other sprint relays at outdoor nationals. To break this record though both teams would have to stack the box. That would mean Branch would have to run Tilmon, Ballard, Ballard, and either Shockley or Nichols while Bullis would have Hall, Harris, Leonard, and Frederick. If those teams run those lineups then the record is, for the first time in over twenty years, potentially going to be a sprinters' record again.